Dask and XGBoost can work together to train gradient boosted trees in parallel. This notebook shows how to use Dask and XGBoost together. XGBoost provides a powerful prediction framework, and it works well in practice. 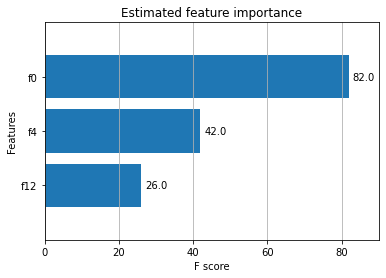 It wins Kaggle contests and is popular in industry because it has good performance and can be easily interpreted (i.e., it’s easy to find the important features from a XGBoost model). We setup a Dask client, which provides performance and progress metrics via the dashboard. You can view the dashboard by clicking the link after running the cell. First we create a bunch of synthetic data, with 100,000 examples and 20 features. Dask-XGBoost works with both arrays and dataframes. For more information on creating dask arrays and dataframes from real data, see documentation on Dask arrays or Dask dataframes. Now, let’s try to do something with this data using dask-xgboost. dask-xgboost is a small wrapper around xgboost. Dask sets XGBoost up, gives XGBoost data and lets XGBoost do it’s training in the background using all the workers Dask has available. The bst object is a regular xgboost.Booster object. This means all the methods mentioned in the XGBoost documentation are available. We show two examples to expand on this, but these examples are of XGBoost instead of Dask. We specified that only 4 features were informative while creating our data, and only 3 features show up as important. 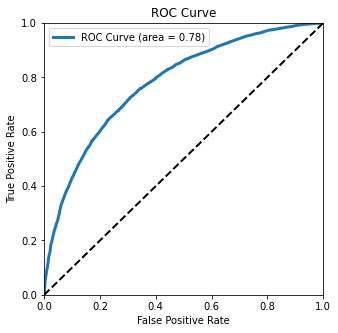 This Receiver Operating Characteristic (ROC) curve tells how well our classifier is doing. We can tell it’s doing well by how far it bends the upper-left. A perfect classifier would be in the upper-left corner, and a random classifier would follow the horizontal line. The area under this curve is area = 0.76. This tells us the probability that our classifier will predict correctly for a randomly chosen instance.